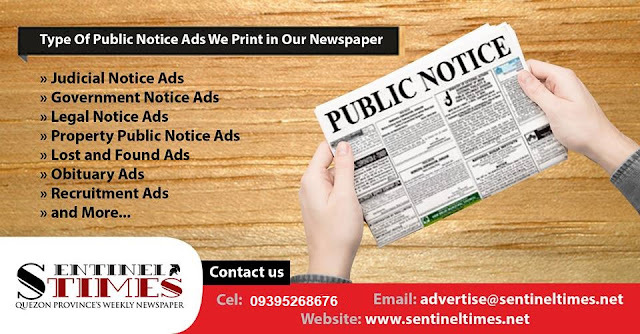 The convenient, fastest and easy way to place a Public/Legal Notice ADS in Sentinel Times, hassle free! Here at Sentinel Times, we make advertising convenient and easy for you. Sentinel Times Weekly Newspaper is a Quezon Province weekly newspaper, published every Saturday. We also publish advertisements and Extra-Judicial Notices, Legal Notices, Affidavit of Self-Adjudication, Affidavit of Loss, Lost and Found, Missing, Summons by Publication, Divorce, Court Order, Notice to the Public, Disclosure-Financial Statement, Tax Appeal, Job Openings, Obituaries, City/Municipality/Barangay Ordinances & Public Bidding and many more. A convenient way to have your Legal Notice and Public Notice published in our newspaper: Send document online, pay via payment center near you and receive a copy of newspaper via courier free of charge (outside Lucena City). For your convenience, we accept advertisement and notices by email: email us at advertise@sentineltimes.net. Payment is due prior to publication. For your convenience, you can choose to pay via payment center or bank transfer. For your convenience, we can send you the newspapers free shipping anywhere in Quezon Province (outside Lucena City) with LBC or through your chosen courier service. Please call 09395268676 (during business hours) for additional information and look for Nimfa Estrellado. Sentinel Times Weekly Newspaper is published at Salamillas Compound I, Barangay Isabang, Lucena City, Lucena City Quezon Province. Sentinel TImes is accredited to publish legal and judicial notices, and similar notices or announcements under pertinent laws ans Supreme Court issuances, ordered at Lucena City, January 9, 2019.